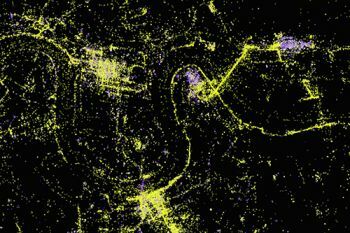 Alex Kachkaev, a PhD student in City University London’s giCentre, creates a visualisation of the places where people like to take photos around the capital. 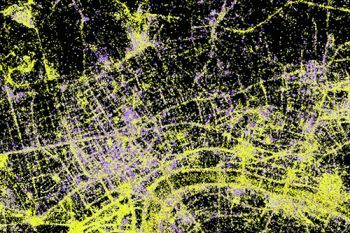 PhD student in City's giCentre, Alex Kachkaev, has mapped the most photographed places in London by creating a data visualisation which uses over 1m geolocated photographs generated by forty thousand people who uploaded them to photo sharing service Flickr. Each dot in the map represents a single photograph whose location was identified either automatically via GPS devices built into the camera or smartphone, or was added manually by the person uploading it. The colour of each dot represents the amount of light present in the scene, enabling the researchers to distinguish likely daytime, outside photos (yellow) from those taken either at night or indoors (purple). This light (or luminance) was calculated automatically for each photo by examining the image 'EXIF' metadata that includes information such as exposure, aperture and ISO speed. "In his PhD research, Alex has mined the various photo sharing websites, such as Flickr and Panoramio, in order to provide an automated generation of attractive walking routes in London. By looking at where people choose to take photos we get some idea of which parts of the urban landscape people find worthy of photographing and by implication, potentially attractive places to be. Much of the research challenge addressed in Alex's work arises in removing those photos that have little influence over perceived attractiveness, such as those taken indoors or those taken at specific events like the Olympics or Jubilee celebrations." 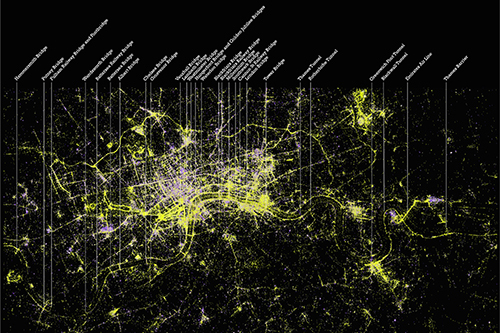 "The result is a map of photogenic London showing the places, times and events people choose to capture an image. The attraction of the banks of the Thames and its major crossings are evident. We see daytime and night time London superimposed, outdoor and indoor space, parks and lakes, evening venues and sporting events. A shared image of images, of place and space, of the photographed and the photographer." Various parts of this research, carried out in the giCentre, were presented at national and international conferences and have been positively received. The most recent paper, titled "Glyphs for exploring crowd-sourced subjective survey classification', was awarded the prestigious IEEE EuroVis 2014 Best Paper at its annual conference (10th-13th June). To read the paper in full, please visit this link. A high-resolution version of the map will welcome visitors to the Bridge Exhibition at the Museum of London Docklands, which opens on 27th June. The story of this data visualization has also appeared in a recent edition of the Londonist. For more information on the giCentre please visit this weblink.